A common theme in personal development literature is that we should take responsibility for our circumstances in life. It's best for us, in other words, to see ourselves as in control of our situation, as opposed to believing that forces beyond our control create it. I'll call this idea the "responsibility ethic." On the surface, this doesn't seem controversial. If I'm in debt, for instance, it won't do me any good to sit around blaming the stock market, my family, the current phase of the moon, or some other outside force. I have no reason to take steps to get out of debt unless I accept that my actions -- cutting my expenses, selling stuff I don't need, and so on -- can fix the situation. Personal growth's critics, however, often argue that the responsibility ethic has unsavory consequences. A person who believes they control their lot in life, the critics say, will be prone to self-flagellation -- i.e., to beating themselves up. If they don't get the results they want, in whatever area of life they're trying to improve, they'll blame themselves. Suppose, for example, that I do everything in my power to get out of debt -- I cut up my credit cards, sell unnecessary stuff, and work with a debt counselor -- and I still fail to reduce my debt by the desired amount. If I think I'm 100% in control of my situation, I'll see this failure as proof that I'm lazy or stupid, and suffer over it. As Steve Salerno writes in SHAM: How The Self-Help Movement Made America Helpless, "if you make people believe they have full control over their lives, and then their lives don't get better (or even get worse), how could that not throw their synapses into turmoil?" In this series of posts, I want to examine this argument more deeply. First off, I'll talk about three reasons to question the assumption that the responsibility ethic promotes self-blame. 1. Psychological Research. Psychologists use the term "locus of control" to describe a person's beliefs about the degree to which they are responsible for their circumstances. The more I tend toward an "internal locus of control," the more I believe in my own power to direct my destiny. By contrast, the closer my beliefs are to an "external locus of control," the more I think I'm at the mercy of factors I can't influence. For example, suppose I'm a student, and I'm about to take a test. If I have a strong internal locus of control, I'll believe that, if I work hard enough, I'll get a good grade. But if I have a strong external locus of control, I'll assume that studying will have little effect on how well I do, and the grade I get will be largely the result of luck. Not surprisingly, psychologists have found that students who tend toward an internal locus of control usually study harder. The locus of control concept is relevant here, because psychological research has repeatedly found a relationship between people's locus of control and the likelihood that they will suffer from depression. People closer to an internal locus of control, as it turns out, are less prone to depression than people who tend toward an external locus of control. In other words, people who see themselves as responsible for their circumstances in life are less likely to get depressed. In fact, it's those who see themselves as mere pawns of other people or forces who are more likely to have that problem. This makes sense, psychologists say, because of the feelings of helplessness and despair created by their perceived lack of control. These findings don't mesh well with the critics' argument. If the critics are right, and people who see themselves as in charge of their lot in life are likely to beat themselves up, we should expect them to be more prone to depression than those who believe they're at the mercy of outside forces. But the exact opposite appears to be true, which casts doubt on the idea that the responsibility ethic is creating all this unnecessary suffering for people. I'm not claiming that this completely settles the issue. After all, if we really want to know whether personal growth's responsibility ethic is causing suffering, we need to study people who do some kind of personal development activity -- reading self-help books, going to transformational workshops, or something along those lines -- and ask whether that activity has any relationship to depression, problems with anger, and so on. And these, of course, would have to be books, workshops, and so forth that encouraged a sense of personal responsibility for one's situation. Psychological researchers have only recently begun to look into the effect of personal development techniques (if we don't count psychotherapy) on mental health issues like anxiety and depression. There is no clear consensus yet: in one study of a wide range of self-help books, the vast majority of the readers surveyed reported "a significant improvement in their condition." Another suggested that saying positive affirmations like "I love myself," while apparently helpful to some people, may actually cause people with low self-esteem to feel worse. There have also been many studies of the psychological effects of meditation, suggesting that meditation helps alleviate depression and other emotional problems. However, as far as I'm aware, there is no concrete evidence that the responsibility ethic, whether presented through books, workshops, or some other medium, is doing all the psychological harm to people that the critics allege. Thus, the "self-blame" argument against the responsibility ethic isn't obviously correct or commonsensical at all. In the interest of keeping these posts at least vaguely succinct, that's all I'll say for now. In my next post, I'll discuss my second reason to question the self-blame argument, and also discuss why, even if the argument is correct, it doesn't follow that we should reject the responsibility ethic. Hi Chris, the pernicious part of the total-responsibility line (vs response-ability and doing what we can) is that it allows the wealthy to blame the poor. Do you plan to deal with this kind of thing? 1. Similarly to what I say above, psychological studies I’ve read have found that people with an internal locus of control are actually more likely to give to charity, and to become involved with political causes. That is, people who believe that they are personally responsible for their circumstances appear to be more inclined to help others, not less. And this makes sense because, if I believe that nothing I do matters, it makes no difference from my point of view whether give to charity, vote for a welfare program, and so on. In other words, if personal growth teachings cause people to gravitate more toward an internal locus of control, the evidence suggests that this will have people become more generous, not less. The critics haven’t dealt with this issue, as far as I know. This is particularly important because there’s no concrete evidence for the argument that the responsibility ethic causes people to become callous — that, say, people who read self-help books give less to charity, or something along those lines. 2. The argument you are talking about seems to go like this: If I believe I am responsible for my lot in life, it follows that I must also believe everyone else is responsible for theirs. And it also supposedly follows that, if I think other people are responsible for their situations, I should not help them if they are worse off than me, because it’s their own fault. But I don’t think this logic holds. It’s entirely possible that I could believe I have all the abilities necessary to succeed at something (I have good health, an education, and so on), and thus that I’m responsible for my outcomes, whereas someone who doesn’t have those things isn’t. But let’s say it does logically follow from the “responsibility ethic” that others are responsible for their circumstances too. Suppose you knew someone who had a good job but then became a drug addict, lost their job and fell into poverty. Would you say you have no compassion for that person because he chose to take drugs? I doubt that you would. The point is that, even if a person’s bad choices are responsible for his circumstances, that doesn’t logically render him undeserving of help. The Christian notion of forgiveness despite your sins is another good example. Finally, that’s a good point about degrees of responsibility — I’ll make clear in later posts that I don’t mean to come out in favor of books or workshops (if they exist) that teach us that we’re gods and we can control the weather through thought or something like that. When I say moving toward an internal locus of control I mean basically moving toward the responsibility end of the spectrum and away from the helplessness end. From my reading of ethology & evolutionary psychology, two kinds of depression arise. The first is when all the control is removed from the individual – negative stimulii over which there is no control. The second is through loss of status in the social order – again via circumstances outside one’s control, often in spite of one’s best efforts. But how to recover? And whence is the well that resilient people draw upon? I think it begins with recovering a sense of self-responsibility and returning the locus of control to one’s self. Resilient people experience the same physical and social exigencies as the rest of us, but they look at opportunities for immediate return of control and don’t sweat the Big Stuff until they’re past the present demands. Evan gave me a pointer your way and your argument is interesting. I think a lot of “self-help” is often infantilising and prone to fantasy thinking. The truth, as always, is somewhere between the extremes. I love the new blog. You started out with a great topic. To me there is little doubt that a strong internal locus of control better serves us. I also doubt the suggestion that people who accept responsibility are more prone to self blame and thus causing more damage than good. My experience is that people with a high external locus of control tend to call themselves stupid or unlucky more than a person who takes control and responsibility for that which they create. Hi Adam — I think “resiliency” is a good way to put it — to bounce back from setbacks we experience in life, we need some degree of belief in our power to affect our circumstances to avoid hopelessness. To the extent self-help books and other forms of personal growth promote the resiliency you’re talking about, I like what they’re doing. You raise another question I think is useful, which is: is the responsibility ethic pushing people too far toward the “internal locus of control” end of the spectrum, causing them to believe they’re basically gods and making them a danger to themselves or others? I don’t see a lot of evidence of this. There are passages in “The Secret” and other popular self-help books that can be interpreted to promote such a view, but the practical question that doesn’t get much attention is: is that how people are actually reading it, and if so are they acting on that belief? Hi Mark — yes, I’ve noticed the same thing — that the people I know who seem to feel the most despair tend to be the ones who don’t believe they have much power to influence what happens in their lives. I don’t get the sense that such people are more likely to be generous or politically active. So, I’d agree that the self-blame argument is barking up the wrong tree. I love your new foray, Chris. This comment had more to do with saying, “Thumbs up,” than a specific comment about the content — but I just wanted to give you my full support for now. Hi Lori — good to see you here and I’m grateful for your support. You’ll see a different side of me here, I think, more of the “Warrior” than the “Lover” or “Magician” energy — and I’m looking forward to sharing it with you. I actually partly agree with the self-blame theory. Not that we shouldn’t take responsibility for our destiny, but I think that we are too hard on ourselves, tearing our confidence down. We need to be more encouraging, empathetic and loving with ourselves. I procrastinate because of fear. I want to be perfect, but there is no such thing. It’s better to work hard, put out a good product and work on making it great as time goes on. This is a sore spot for me as you can tell. I’m working on being a little nicer to myself, so the work is more enjoyable. Chris — Wow. I like the new site and I love this idea. This is powerful beginning!! You’ve made start thinking about the ethic of responsibility. I’ll be interested in the future exploration of this. In the meantime, a couple of things come up for me. First of all, how much do you think religion plays into the ethic of responsibility. Hi Karl — it sounds like, when you put something off, you tend to do it because you’re afraid that it’s not going to be perfect, and then you’ll end up beating yourself up over it. I get the sense that’s a pretty common cause of procrastination. You’ve actually anticipated what I’m going to talk about in my next post, which is the difference between taking responsibility for what happens in your life and blaming yourself / suffering over it. This is a distinction that a lot of personal growth writings make, but it’s often dismissed as unrealistic or immoral by the critics. As we’ll see, it actually raises some serious and interesting philosophical questions. The way I look at it is that we need to be very realistic in acknowledging what we have control over and what we don’t. Pretending that we have control over external factors that are realistically beyond our control is damaging. We assume responsibility for things we cannot change and can feel frustrated with our failure. It’s crucial that we take responsibility for the things we *can* change, but books like The Secret – which ask you to take responsibility for *everything* that happens in your life, including getting hit by a drunk driver – don’t promote responsibility. They promote irresponsibility and delusion. Plus, I wouldn’t always go by what self-help enthusiasts say when it comes to the benefit they derive from the books they read and the seminars they attend. It’s often a sense of hope and motivation they walk away with and not necessarily a change in how they think or behave when confronted by life’s challenges. This topic deserves a blog post (or a book!) on its own! Chris, I love your new site. Your other site is great, but this one speaks to a deep passion within me. The stuff I’ve read seems to suggest that the belief that God, rather than the individual, is directing events in the world — although it would logically seem to lead to an external locus of control — doesn’t necessarily produce one in practice. In other words, it seems like the practical consequences of spirituality for how people lead their lives don’t necessarily track the logical implications of their spiritual beliefs. But sometimes they do, I’m sure. I guess this shows the limitations of psychology (or any science) in trying to understand something as complex as a human being. Hi Haider — thanks for your comment — I think this illustrates how many profound philosophical issues are raised by the debate about personal growth. On being realistic about what we’re responsible for, I wonder: is it possible for us to know what really causes the events in our lives? In other words, can we determine whether the responsibility ethic is factually correct or not? My sense is that the answer is no. I think David Hume put it best when he talked about how we can never know with 100% certainty that, say, dropping an object will cause it to fall to the ground. We can only assume it will based on past experience. Causation is something we pretty much take on faith, and in that sense the whole notion that I can “have the wisdom to know the difference between things I can and can’t change” is doubtful. If this is true, we can’t answer the question of whether the responsibility ethic is “true” — all we can say is whether it is resourceful — whether it promotes the kind of outcomes we want. For example, although I can’t know for a fact whether studying will cause me to get a good grade on a test, I can ask whether it would “work” for me to believe that it will. From the evidence I review in this article, the answer seems to be yes, at least generally speaking — admittedly, there’s no way to know whether the answer is yes for 100% of the population. But won’t the responsibility ethic cause people to beat themselves up more? I don’t (and probably can’t) know for a fact. In this article I just want to question the assumption, which is often put forth as simple common sense by the critics, that it will. But even if the critics are right and the answer is yes, we still need to weigh the harm created by people beating themselves up more against the benefit of people taking action to improve their lives — which I’ll discuss further in a future post. Now, like you say, yet another question (among many) remains: do self-help books, seminars, and so on actually cause people to move closer to an internal locus of control, or do they just come away with a temporary high that leads nowhere? That’s a hard question to answer generally, because personal growth is such a varied field. But I think we can reasonably ask: do we have reason to question the judgment of people who say they benefit from personal growth? That’s an issue I’ll definitely get into further. I’m loving this discussion so far, everyone — I’m glad this has struck a chord! Hi Megan — that’s a great point, I think, and it’s definitely one I intend to develop here. I would put it this way: when someone likes a piece of music, we don’t usually second-guess their preference in all kinds of ways. We wouldn’t argue that they don’t _really_ like the music — they’re only deceived into thinking they do, or that listening to music is bad because it lulls them into complacency about the world’s problems; or that other people don’t like that piece of music, so it must be just a placebo effect; or something like that. That would sound absurd. And yet we see all these arguments directed against personal growth, and I think we need to ask whether that makes sense. Chris, I’m glad I came across your site. Many personal growth writers don’t know how to spell philosophy let alone discuss it. We definitely need to dig a bit deeper on some of the issues we tend to discuss superficially. When it comes to verifying our knowledge of the world, I would side with Ayn Rand and her philosophy of Objectivism. I would recommend her book: Introduction to Objectivist Epistemology for an explanation of the reliability of human reasoning. You might also be interested in Leonard Peikoff’s Objectivism: The Philosophy of Ayn Rand. I definitely don’t agree with some critics on why they object to the responsibility ethic, but also believe we shouldn’t stretch the scope of responsibility beyond its bounds (whatever they may be ). Thank you for a thought-provoking post and discussion. Hi Chris, what a great start to a new site! I enjoyed reading some of the comments. I agree with what Megan said. There can be just too many variables, it is hard to make a generalization, what works for one may not quite work for another! Hi Haider — thanks for the recommendation — I’ve read some of Ayn Rand’s novels but not her nonfiction stuff, which sounds interesting. Hi Evelyn — yes, that’s my experience as well, that everyone’s mind and body is different, and we all need to do our own experimentation with personal growth ideas to find what works for us. Like what you’re doing here. I think there need to be more dialogue like this. But it seems that you are focusing on one point here: taking 100% responsibility is not harming anybody, so what’s the big deal? 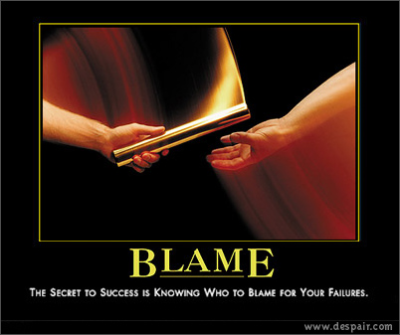 I came to that conclusion assuming I agree with you that 100% responsibility does not lead to self-blame. But here’s where I stand: it’s just not true. Everyone knows that we are not 100% responsible for everything. That’s not criticizing something, that’s pointing out a fact. It’s like saying there’s no Easter Bunny. And I stand by that. Hi Carlon — thanks for your comment. I’m going to cover many of the debates around personal growth — this first post is just a small piece of the whole puzzle, and there’s much more in the pipeline. Are we actually responsible for our circumstances? As I said to Haider, I think it’s impossible to know for a fact whether my actions have created my life situation — whether, for instance, I caused a past relationship to break up, or it was something that happened in my partner’s life, and so on. There are innumerable factors that could have contributed to creating each event in our lives. But then, I think, the question becomes: if I cannot know for certain, what belief is it most resourceful to adopt? Will it serve me best to move toward an internal locus of control — to see myself as capable of changing my situation for the better? Or will it serve me to move toward the external locus and see my results as the product of chance or forces beyond my control? To that question, I would say moving in the direction of taking responsibility seems to be the best answer. I’d also agree with you that it probably is not helpful to say “my success or failure is my own fault,” because the idea of “fault” implies self-blame. Like I say in the second post in this series, I think it’s possible to distinguish between taking responsibility for your life situation and punishing yourself for it.